Having just returned from Kansas and seeing the amber waves of wheat, I was moved to bake a bread that represents the American Breadbasket. This simple basket-weave of bread sticks is a stunning way to serve tuna salad (or anything else your craving) at your 4th of July picnic. 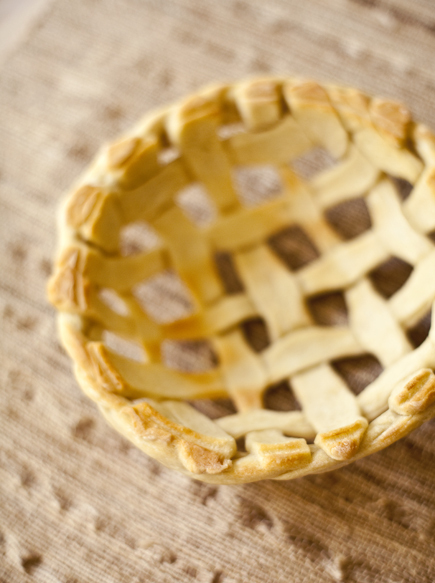 You can make a large one to share or smaller baskets for individual plates. 1/2 pound dough from Artisan Bread in Five or Healthy Bread in Five or Artisan Pizza and Flatbread in Five. 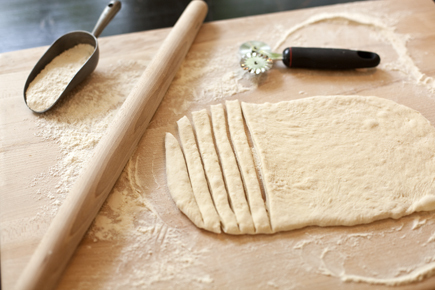 Roll a 1/2-pound of dough to 1/4-inch thick rectangle (about 6×12 inches). 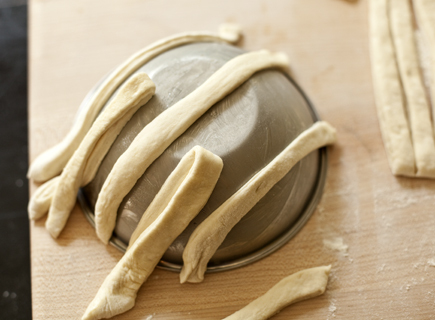 You may need more dough if you are using a larger bowl. 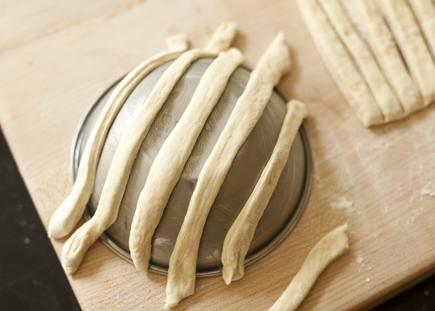 Using a Pastry Wheel or Pizza Slicer, cut the dough into 1/2-inch wide strips. 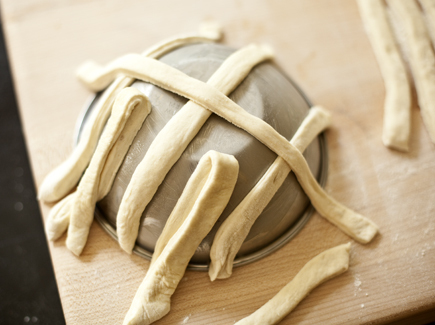 Drape dough strips over the top and sides of the bowl, making them evenly spaced. lay another piece across the strips that are still laying flat on the bowl. Unfold the strips over this new piece. Then repeat with the strips that had not been folded over the last time. 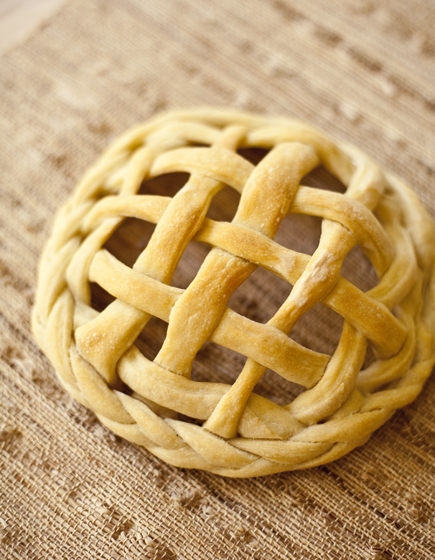 Continue until the entire bowl is covered with the basket-weave. Trim the strips to fit just to the bottom of the bowl. Stretch three of the remaining strips. Braid the three strips together, making the braid as tight as possible. 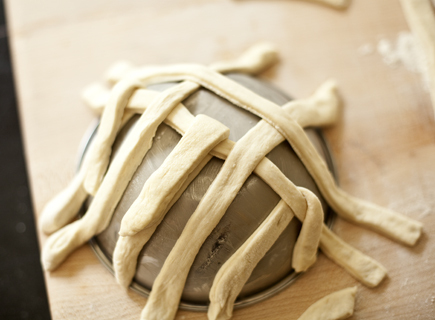 Paint the edge of the basket with water using a PASTRY BRUSH. 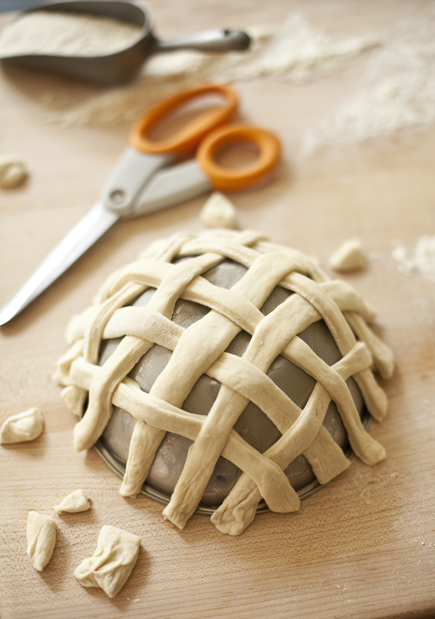 Transfer the dough covered bowl to a baking sheet lined with a Silpat Non-Stick Baking Mat or parchment paper. Bake for about 25 minutes or until golden brown. 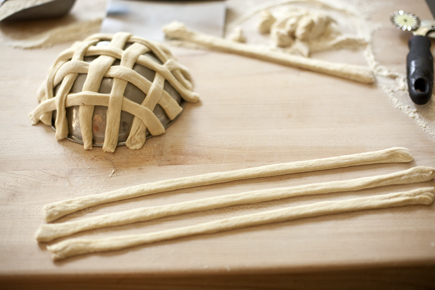 This may take longer or shorter depending on the kind of dough you use and the thickness of the strips. Carefully pry the bowl out from under the basket. 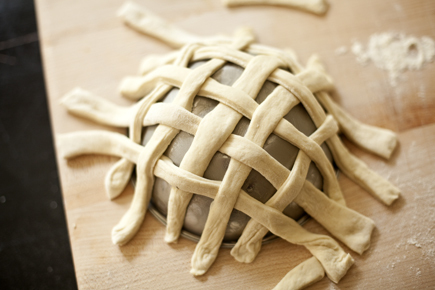 If the inside of the basket is too pale, you can return it to the oven and bake for another few minutes, without the bowl. This looks amazing! I can’t wait to give it a try! 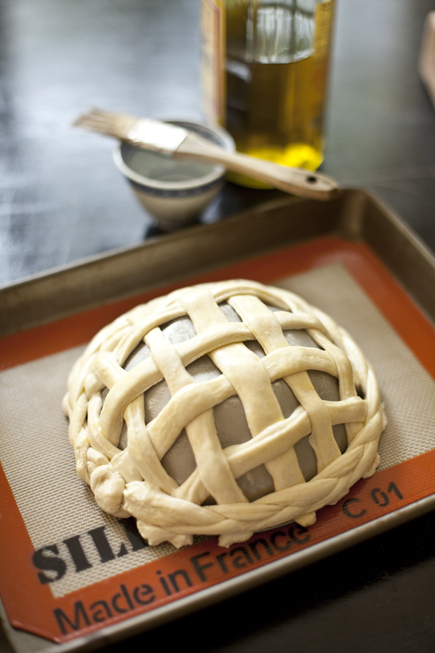 This is absolutely beautiful and I’m making this for sure!! I cant wait to try this im off here lol…. As the instructions mentioned baking 2x. Is it possible to freeze this after the 1st bake and then finish the baking when on the day of eating? my second question is, when it is time to roll out the dough can additional flavors be introduced to make this bread more a savory bread basket? I Would Really like to make this but my guest list usually has 10 – 20 people and I can not imagine having to do all this on the same day of entertaining. Reimer: It might work, but it’s a little delicate to freeze, plus might dry out or pick up freezer flavors with all that surface area. My recc: try it in advance. Can always press in herbs, flavorings when rolling out. Thank you SO MUCH for the Quick Response. .Will do as advised and try it out first. Will try adding the herbs as suggested too. I love your pizza recipes in your new book. It has been HOT here in Iowa for the last several weeks, but I am still able to make pizza and all sorts of other flat breads on the grill. I just wanted to let you know about a pizza peel called the “Super Peel”. It has a cloth that works as a conveyor belt and makes it a breeze to transfer my pizzas from the kitchen table out to my hot stone on the grill. It is WAY easier than a regular peel and has saved many a pizza that has stuck to the table. My 2 teenage kids love my pizza better than any pizza place pizza – that’s a real compliment! Thanks!!! My goodness! That’s just crazy. I may have to do that. I’ve never even seen something like this before! I’m generally new to cooking but still, so creative and yummy looking. I don’t have a “Website” Page. Just like to find different ideas for my dinner parties. 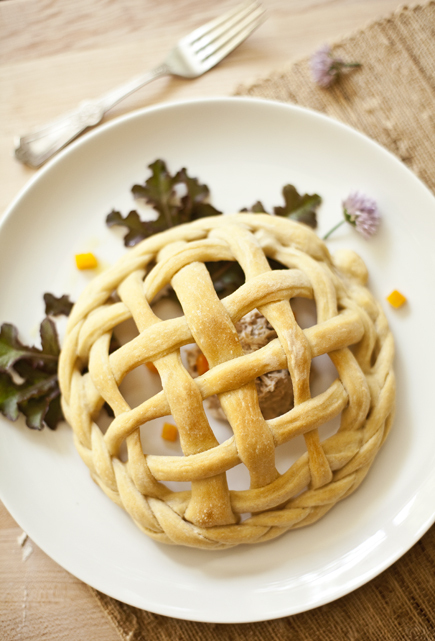 I liked the Braided Bread Basket I saw on the “Spice of Life Site.” Which I visit daily through my Facebook Page. I had a bread basket once but it had been baked and glazed somehow so you could keep it and use again and again. It was similar to this one but looked like it had been done on a cake tin. 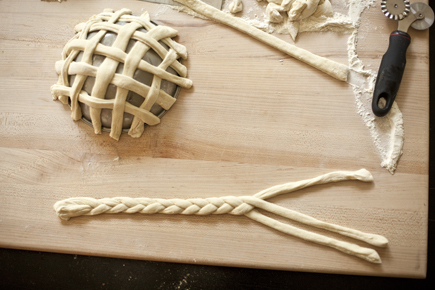 I’ve been making this same kind but use a cross between yast bread reipe and pretzel recipe. For the finish , I brush it with eggwash and it makes it glossy and sort of works like a glue for a handle as well. These are really nice. I will try the water though. Only last for about a week and a half and starts to dry out. I haven’t figured out how to keep it longer except to spray with laquer. But then it won’t be edible. 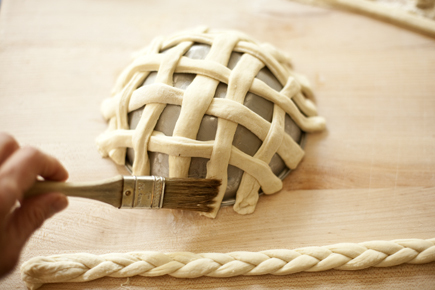 People go crazy over hand crafted edible art. It is hard to keep the bread from getting very stale after more than a couple of days. If you did this very thin and made it more like bread sticks, it may last longer. I need some ideas on how to use these. Salad would fall through and the dressings would make the bread soggy. I’d love to make these but lack Ideas on what to put in them. Truth be told, they are mostly decorative!